The history of St. Peter Church and Catholicism in Jefferson City can be traced back to just ten years after the founding of the capital city in 1821. Fr. Felix L. Verreydt, S.J., came from the Indian Mission of Portage des Sioux, St. Charles County, Missouri, and celebrated the first recorded Mass in Jefferson City in 1831 in the home of Bernard Upschulte, then located on the corner of High and Mulberry Streets, now located behind the Cole County Historical Museum. In 1838, Fr. Ferdinand Helias, S.J., newly appointed pastor at Westphalia, Osage County, Missouri, at the request of the visiting Rt. Rev. Joseph Rosati, C.M., first bishop of St. Louis, organized the local Catholics into a community and celebrated Mass in private homes until a site could be selected for a church. (Interestingly enough those “private homes” were less than 10 in number as records show a total of nine Catholic families registered in 1838!) Fr. Helias was also the first priest to minister to the inmates of the state prison, located in Jefferson City. The original candlesticks and crucifix that he carried in his saddlebags throughout his ministry are on display in the St. Peter Parish Life Center.The first site for St. Peter Parish Church was the old state capitol building, now the home of the Governor’s Mansion. A petition was presented to the General Assembly to allow local Catholics to purchase the building as the first church. The governor and the Senate approved, but the measure failed the House of Representatives by four votes. 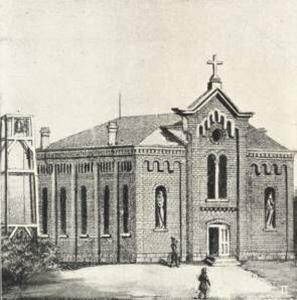 The first Catholic Church in Jefferson City was then constructed in 1845 & 46 under Father Helias, on the present site of St. Peter School. The structure was a 30 by 22 foot oaken-board building built by 18 men from the forest wilderness that comprised Jefferson City at the time. Fr. Helias named the new church building in honor of St. Ignatius Loyola, the founder of the Jesuits. The Jesuits soon turned the care of the new mission over to Archbishop Peter R. Kenrick, St. Louis, and in 1846 the Archbishop named Fr. James S. Murphy the first resident pastor. When Fr. Murphy dedicated the new church, he named it in honor of St. Peter, the Prince of the Apostles and the patron saint of his Archbishop. St. Peter Catholic Church became the 59th parish of the St. Louis archdiocese. The young church served the community well for 12 years until the growth of the Catholic population forced Fr. William Walsh, the fourth pastor, to construct the second St. Peter church structure on the corner of Broadway and High Streets. It was built of brick and dedicated in 1856 on a plot of land purchased for $600. The Jefferson Inquirer, the city newspaper, declared the new brick building to be the “handsomest building in the city. The History of the Diocese of St. Louis, in speaking of St. Peter Parish, Jefferson City, states: “In 1838 there were nine families; in 1855 there were forty,” (page 360). The fledgling parish was indeed growing. In 1859, Fr. Henry Van der Sanden, arrived as the first in a long line of assistant pastors. 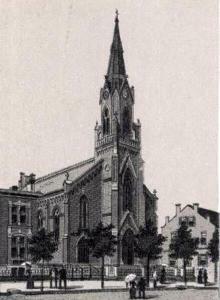 The brick church served its function until 1881 when Msgr. Otto Joseph Stanislaus Hoog, the seventh pastor, had it razed to make way for the present church. The present church was designed by Adolph Druiding and constructed by Fred H. Binder with 800,000 bricks donated by G.H. Dulle. It was placed on the National Register of Historic Places on June 18, 1976. The church is pure gothic. It is 173 and one half feet in length. It is 60 feet in width. It has a seating capacity of 700. The clock tower, a city landmark, rises to a height of 170 feet. The tower contains four bells cast by the Struckstede Foundry with an aggregate weight of 8,000 pounds, purchased at a cost of $1,354 and dedicated to St. Peter (55 inches in diameter), St. Joseph (46 inches), The Sacred Heart of Jesus (34 inches), The Blessed Virgin Mary (28 inches).It is impossible to separate our parish history from the history of Jefferson City and the city’s role as the seat of state government. The clock, installed in 1888, is of service to both church and state. It rings the hour for divine services and every four years the new governor of Missouri is sworn into office when C-sharp minor cords have struck noon. In 1911, during the fire at the State Capitol building, which sits literally across the street from our parish home, the Missouri State House of Representatives used St. Peter’s School library to conduct business for the remainder of that legislative session. Gov. Joseph P. Teasdale, 1977-81, was a member of St. Peter and attended noon Mass frequently. The interior of the church retains the gothic motif. Two majestic tiers of fourteen pillars support the ceiling, dividing the church into three naves. The height of the center nave is 56 feet; the two side naves are 42 feet. Three gothic reredos attest to our history. They are carved of white walnut with rich gilt. The main, center reredos, which houses the tabernacle, is 49 feet high. It contains a center statue of the Sacred Heart of Jesus. The two lower niches contain statues of St. Peter, the first pope, with keys, and St. Paul, Apostle to the Gentiles, with sword. The side reredos are 24 feet in height. The shrine to the Blessed Mother contains statues of St. Agnes, patroness of virgins, with a lamb, and St. Rose of Lima with the Christ child, patroness of South America (a link which the Diocese of Jefferson City has enjoyed through our missionary work in Peru). On the opposite side is a statue of St. Joseph, accompanied by one of St. Aloysius Gonzaga, patron of youth, with crucifix, and another of St. Francis de Sales, patron of authors and the press, with a book. The present church’s service to Jefferson City began on Feb. 2, 1883, when Monsignor Hoog celebrated the first Mass. It was solemnly dedicated on Aug. 12, 1883, by the Rt. Rev. Patrick J. Ryan, Coadjutor Bishop of St. Louis. Upon the approval of Pope Pius XII in 1956, the State of Missouri was divided into four dioceses, and the Diocese of Jefferson City was formed. St. Peter Church was selected as the first Cathedral. The Cathedral of St. Peter served the founding bishop, the Most Rev. Joseph M. Marling, C.PP.S., for 12 years, from his installation in 1956 until Christmas Eve 1968 when the cathedral’s jurisdiction was transferred to St. Joseph Parish. While it was the cathedral location, St. Peter Church witnessed history.It was the site of many priestly ordinations, including that of the first priest of the diocese, Fr. John W. Buchanan, in 1957, who would return as the eleventh pastor of St. Peter in 1972. Fr. Anthony J. O’Connell, who was ordained here in 1963, would become the first priest of the diocese named a bishop. He was selected as the founding Bishop of Knoxville, Tennessee in 1988. Another history making event for St. Peter took place in 1962 when it became the church of departure for the first group of diocesan missionaries to Peru commissioned by Bishop Marling. Still another historical event for St. Peter Church was being the site, on Holy Thursday, 1965, for the first Concelebrated Mass in the diocese. Monsignor Joseph A. Vogelweid, P.A., associated with St. Peter’s for over 60 years, was the diocese’s first Vicar General and the only rector of St. Peter Cathedral. He has become a legend in Jefferson City. Monsignor played a role in the foundation of the Carmelite Monastery, St. Joseph’s Home for the Aged, and the establishment of the city wide Veteran’s Day Mass at St. Peter. Upon his retirement in 1969, his assistant for 17 hears, Fr. Norman J. Ahrens, became the tenth pastor. That same year, Fr. Gerry Kaimann, arrived as the first in a long line of transitional deacons. Throughout her history, St. Peter Parish Church has undergone different renovations. In 1983, the Church was extensively renovated in preparation to celebrate its centennial year and to respond to the liturgical changes begun with the Second Vatican Council. In the construction of a new altar of sacrifice, portions of the former communion rail were used. A new pulpit was built; two rooms for the Sacrament of Reconciliation were developed. The baptismal font, purchased in 1888, was restored to its original beauty. Central air conditioning and a restroom were added, and a new roof was installed.On July 1, 1985 by assignment of Bishop Michael F. McAuliffe Father John Fischer, a native of Tipton, Missouri, became the new (the thirteenth) pastor of St. Peter Parish. When he came to St. Peter’s Father Fischer served also as chairman of the Diocesan Liturgical Commission, so at his appointment as pastor, he placed great emphasis on the importance of liturgy and worship. In 1987, the Church organ was renovated and the addition of thirteen ranks by the Quimby Pipe Organ Company was completed. In 1989, repairs were done on the bell tower and lights were installed to illuminate the tower and clocks at night. That same year, every roof of every building was replaced or repaired. A restoration of the bell tower began June 1, 1995 and was completed that summer. Inside the tower, a chime of four bells again sends forth its jubilant peal, ringing in the Lord’s Day, noting the hours of liturgy, and summoning worshippers. The new bell ringing system sounds the C-sharp minor chord using four electromagnetic hammers. An electronic digital control system conducts the operation of the four bells. It provides a tolling and simulated swing for the 3-bell and the single bell Mass calls, the Angelus, the funeral toll, and the hour, quarter, half and three-quarter hour strikes. As has already been mentioned, every four years the new governor is sworn into office at the ringing of the noonday Angelus from St. Peter’s bells. Some 2,000 missing, broken and deteriorating bricks were replaced and much tuck-pointing was done during this time. Several dozen pieces of stone were replaced. Twelve new fleurs-de-lis were cast and put in place. The copper louvers were repaired and the crosses were painted. Brick and stone sealer were applied. Inside the tower, stairs and ladders were repaired and two platforms constructed. Adorning the exterior of the bell tower are four clocks, one on each side. They, too, have undergone restoration, with new movements and new hands. The clocks’ new hands are fashioned from aluminum with counter balances and painted black. The previous hands were made out of wood, and warped after a period of time due to the weather. The new hands are made to fit the 54-inch opening of the dial and, because of the aluminum construction, are expected to last much longer. The new hands are exact replicas of the original hands. In 2002, the interior was again refinished. The work seeks to implement a guiding principle for renovating older churches. There is no substitute for an ecclesiology which is both ancient and modern in the fullest sense (Built of Living StonesUSCCB, 2000). The values of beauty, mystery, and awe guided the work of the Liturgical Design Consultant, Mr. Tom Sater, and the Church Interior Committee, made up entirely of parishioners, in the most recent renovation of our Church. It was important that these concepts blend the gothic architecture and the guide the décor chosen for the Church. Much time was spent studying numerous photographs of the Church from various times in its history so that the artwork from these historic times could be incorporated into the present renovation. In Western cultures, gothic is considered the most religious architectural style because of the ascendant structure, which draws one’s eyes toward heaven and encourages us to meditate on God and the things of God. This is expressed architecturally through the windows and pillars as well as through the colors that were chosen. Darker colors were selected for the ground level and gradually become lighter as it ascends towards the heavens. The colors chosen for the Church décor were determined by the colors in the stained glass windows and the outside bricks and stone. The side naves’ celestial sky treatment with clouds and stars, harkens to the early Gothic desire to Embrace the Heavens. The center nave contains stenciling that reminds us of the five wounds of Christ. The red drop reminds us of the blood of Christ shed for us. It is surrounded by the nails of the crucifixion. The three reredos, which in the past were known as the main and side altars, are also gothic in style and dominate the interior. When the reredos were removed for their restoration, two happy coincidences occurred. The original stain color of the reredos was discovered on the side panel of the St. Joseph reredos. This butternut color was restored to the reredos. Also, when the reredos were removed, the original stenciling on the walls behind the reredos was discovered. The designs consist of St. Mary’s monogram, S/M with her symbol, the rose, and St. Joseph’s monogram, S/J, with the lily. This is the original stenciling from 1883, and was restored to the area behind the reredos. The Church Interior Committee decided to place a mural of The Divine Mercy on the face of the Triumphal Arch over the sanctuary. This is the same location of a previous mural, which had deteriorated beyond repair and had to be removed during the 1982 renovation. That mural was thought to be of the Holy Family with angels hovering nearby. The new mural of the Divine Mercy is the image of Jesus revealed to St. Faustina. It includes Jesus with his right hand raised in blessing and his left hand pointing to his heart. Rays of red light radiate from the right side of his heart, while white rays flow from the left side. The red and white rays shine from his heart and illuminate the world. They remind us of the blood and water that flowed from His side when He gave His life to redeem us. Both the blood and the water symbolize the graces of the Holy Spirit, which were given to us as a result of Christ’s death. The words, Jesus, I trust in You, are always presented with this image, and here they flow across a banner, weaving among the rays, which appear to flow downwards toward the congregation. Ten angels surround Jesus adoring him, although some are looking mischievously toward the congregation below. As the artist was looking for models for the angels, she noticed there were quite a variety of nationalities represented in St. Peter Parish. To better reflect the diversity of our parish and to symbolize our oneness in Christ, the angels’ faces represent children from various races and cultures including African, Asian, European, Filipino, Middle Eastern, and Native American, and Hispanic. While some of the faces are actually based on individual parishioners, some are composites of two or more children’s faces. The artist wanted to capture the expressions of happy children to reveal the joy of the angels in being in Jesus’ presence and trusting in the Lord Jesus Christ, a joy the Christian strives to emulate here on earth. Pope John Paul II instituted the feast of the Divine Mercy in 2000. The angels were a part of the previous mural. The Church Interior committee and artist blended the contemporary concept with our tradition. Many members of the parish expressed a desire to have the parish’s large crucifix suspended over the altar (it was removed in the 1982 renovation). From a design standpoint, this seemed more feasible by moving the altar forward a distance of fourteen feet from where it had been since the 1982 renovation. This allowed us to turn the front pews into a choir style arrangement, where 60 members of the congregation flank the sanctuary. The baldachin, which originally hung over the ambo, but was separated from the pulpit in the 1982 renovation, was moved from the wall on which it hung to the pillar which is directly next to the ambo, thus restoring the original unity of the baldachin with the ambo. A mural of the Holy Spirit in the form of a dove adorns the base of the baldachin, a prayer that asks the Spirit’s anointing on those who proclaim and break open the Word of God in our worship. Lighting was evaluated and upgraded during the recent renovation. The sound system was examined and upgraded as well. New pews were purchased, as the pews (made of fiberboard), which were installed in the 1982 renovation had reached their life expectancy of 20-25 years. The new pews are solid oak in a style consistent with the architecture, and will last at least 100 years. The Stations of the Cross, which were whitewashed during a previous renovation, were stripped of paint and restored, as much as possible, to their original colors. Above the doors of the central vestibule hang three Coats of Arms. The center Coat of Arms belongs to Most Rev. Joseph M. Marling, first bishop of the Diocese of Jefferson City, who used St. Peter Church as his first Cathedral. On the right side of Bishop Marling’s hangs the Coat of Arms of His Holiness, Pope John Paul II. On the left of Bishop Marling’s hangs the Coat of Arms of Most Rev. John R. Gaydos, current bishop of our diocese. The work of the newly completed renovation was celebrated in a mass with Bishop Gaydos on December 21, 2002. Thanks to the love and faith of our generous parishioners, St. Peter Church will continue to stand as a classic example of gothic architecture. As a thriving place of worship, it seeks to embrace the past, present, and future all at once. St. Peter Parish is rich with nearly 170 years of history in nurturing and accompanying the Catholic people in their pilgrimage of faith and serving others in their human need. It has been involved in the education of thousands of children and youth. It has been involved in civil history and in the development of the capital city. St. Peter’s facilities began with a simple log church and have expanded to a five building complex. Its population began with several dozen members and has grown to about 5,500 parishioners today. Seven years after the parish began, St. Peter School was founded. 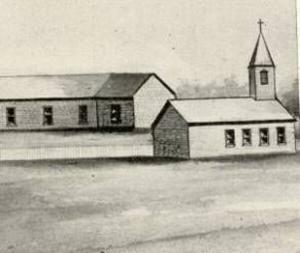 The first school was built in 1854; however, by 1858, more room was needed and the first St. Peter Church became the second school building. Ten years later, the School Sisters of Notre Dame arrived from Wisconsin, and this religious order, along with lay staff, maintains the school today. The third and present school was built in 1889-90. It was designed by Frank Miller, the architect of the Cole County Courthouse, and constructed by H.J. Wallau at a cost of $16,500. It was dedicated by Msgr. Henry Muehlsiepen, Vicar General of St. Louis, on April 7, 1890. A noteworthy Missourian to attend St. Peter School as a child was former Gov. James T. Blair, who served as the state’s chief executive from 1957-1961.St. Peter School has the distinction of being the “Ninth Capitol of Missouri.” After fire destroyed the Capitol building in 1911, Msgr. Selinger offered the use of the school to the state without charge. The House of Representatives accepted his proposal and the remainder of the 46th General Assembly was conducted at the school. In 1931, St. Peter High School was started and, shortly thereafter, the Christian Brothers arrived. The high school served until the founding of Helias Interparish High School in 1955. Msgr. Vogelweid believed that every student who wanted it, should be able to receive a Catholic education, no matter what his or her learning ability. To that end, a special education school was founded by Bishop Marling, Msgr. Vogelweid, the school Sisters of Notre Dame, and dedicated parents, who wanted to give their children with special needs, a Catholic education. Thus, in September, 1964, the Vogelweid Learning Center began. The building housing it had been constructed during the pastorate of Msgr. Vogelweid in the 1950’s, and was named in his honor in 1983. Also in 1995 the Franciscan Sisters of Mary celebrated the Ninetieth Anniversary of the founding of their hospital here in Jefferson City, Missouri. In 1902, three years before the hospital opened, Msgr. Otto Hoog began working with the Sisters of St. Mary in St. Louis toward establishing a hospital here. It was fitting and St. Peter’s was honored to host the portion of the festivities that included the Celebration of Mass. This took place Sunday, October 15, 1995 at 2:00 PM with Bishop Michael F. McAuliffe presiding. Inside the program for the Mass was a drawing of a basket used by Mother Odilia, the foundress of the Sisters’ religious order. Under the basket, expressing the Sisters’ vision, was this touching inscription: “Mother Odilia’s basket is an enduring symbol of caring, compassion, sensitivity and enabling. Mother Odilia took her basket to the streets of St. Louis, begging for food and money for sustenance of the sick and maintenance of the Sisters caring for them. In giving, Mother Odilia and her Sisters of St. Mary received, for the basket was never quite full yet never quite empty. A detailed history of St. Peter Parish can be found in the following bibliography.